In our 3-part series, Greening Your Home, you’ll learn ways to make your home more energy-efficient while also saving you money in the long run. Caring about the environment and being “green” can be easier than you think as a homeowner. You can start today! 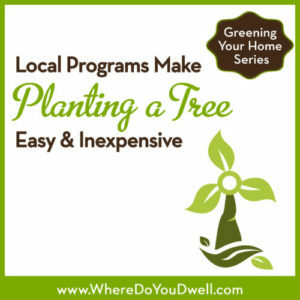 Here’s our final article and it’s all about how to plant trees in your yard (or common yard if you’re in a condo) for much less money. Did you know that by adding a tree to your yard, you can increase your property value and save on energy costs? But maybe the cost or your lack of a green thumb is holding you off. No worries since there are some great programs in the DMV that can help! Trees can help with water drainage. Casey Trees makes it easy and less costly for homeowners to plant trees. It’s their mission to re-tree DC and now you (and your yard) can benefit from two of this organization’s programs. Love a do-it-yourself project? Then the Tree Rebate program is for you! If you purchase and plant a tree, you could get up to a $100 back — which could cover the entire cost to plant your tree. If you’re a novice tree planter or just want to refresh your tree know-how, check out Casey Trees’ instructional videos on how to properly plant a tree at www.caseytrees.org. Casey Trees can also meet with you at your home, assess your property, and recommend what trees to plant and where. They will return later to plant your trees for a $50 co-pay per tree. This can help you if want a bit more guidance or are not interested in planting a tree yourself. RiverSmart also provides for other “going green” options in addition to trees as well, such as rain barrels and rebates for planting your own rain garden. Find out more about all their options here. Here’s a program offered in Maryland that provides a coupon for $25 off your next tree purchase. Keep a look out for any local community tree programs that might offer reduced-priced trees native to your area. Sometimes these events can be held once a year and include help with planting and how-to’s on tree care. Many groups are concerned with the tree canopy in certain neighborhoods and want to help homeowners plant trees.